Most people wouldn’t list salt as an MVP item in their travel kit. I never carried it prior to my five week long trip to South America. I had some oral surgery a few weeks before the trip. My dentist told me to rinse with warm salt water. I dutifully added a small package of salt for my trip. Little did I know how useful it would be. My intent was to use the salt for a warm water oral rinse. I dissolved 1/2 teaspoon (2.5 g) of salt into a 1/2 cup (125 mL) of water. I noticed that the rinse soothed the surgery area. It also worked very well as a mouth wash. I later found out how great the salt was. When I was in the middle of the Amazon jungle I was stung by a wasp. I made a salt paste and smeared it on the wound. The salt paste sucked the poison right out! I didn’t even have a red mark on my hand that night. Later in the trip I caught the group cold. It went up into my sinuses. I mixed salt with water for a sinus rinse. The rinse broke up the mucus and in two days my nasal passages were clear. At that point I was sold. Salt is a wonderful multipurpose item to bring on trips. Mouth wash– Mix 1/2 teaspoon (2.5 g) of salt into a 1 cup (250 mL) water. swish around your mouth. This is a great solid alternative to mouthwash on your trip. Don’t use it full time though – it is very acidic and will erode your teeth if you use it all the time. Gargle – Mix salt into water and gargle. It’s great for sore throats. Sinus cleanser – Mix salt into water. Hold one nostril closed and snort the salt water. Repeat two or three times. TMI, I know, but it works. Stain removal – Salt removes fruit stains and red wine stains! Make a salt paste and smear on the stain. Let it set for a few hours. Rinse with water and wash. Stings and poison oak/ivy – Make a salt paste and smear on the affected area. Let dry. Repeat as needed. Perspiration stain removal – Make a paste out of salt and water. Smear on the stained area. Rinse. Eye rinse – Make a weak solution of salt and warm water. Use a clean gauze pad to sponge over the eye. Make sure you use a different pad for each eye. Shoe deodorant – Sprinkle salt over the foot bed of your shoes. Let it stand overnight. Shake it out in the morning. Skin exfoliant – Massage dry salt over your skin. Rinse with water. Exfoliate dandruff – Sprinkle salt in your hair and massage for 10-15 minutes. Shampoo as normal. Toothpaste – Mix with 1 part salt with 2 parts baking soda for a dry toothpaste. You can even brush with salt alone. It polishes your teeth. Water bottle wash – This is great for stinky water bottles. Fill your water bottle and add salt. Shake it up and leave it overnight. Rinse it out the next day. Bath salt – Add salt to a hot bath. 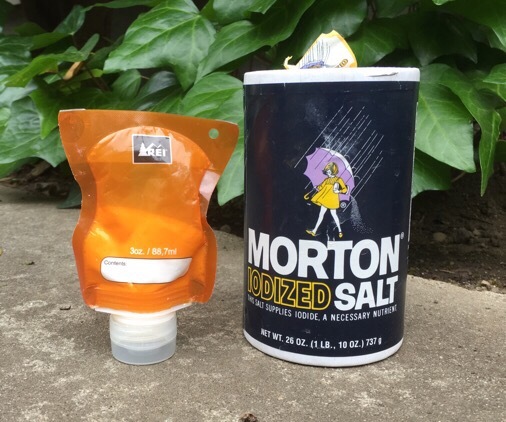 Iodized salt is less effective than mineral salts, but it still works. Use 2-1/2 cups (575 g) for a full bath. I now bring a small container of salt for use as mouth rinse. I use a liquids container as I found that the small zip-lock pill bags leak. One of the best things about salt is that it is widely available. It is easy to obtain small amounts of salt even if you didn’t bring it with you. Yes, distilled water is best. I should have noted that both nasal rinses and oral rinses require clean filtered water. The filter should be 1 micron or smaller. You could also boil the water prior to use. OMG yes. Distilled water, especially when traveling! There are normal travel bugs, and *then* there are brain-eating amoebas!! Salt also removes blood stains. We were traveling minimally and an important item of clothing got blood stained. Someone had left their room service tray in the hall, I borrowed their salt cellar and fixed the problem. That’s great! I normally just use a cold water soak but sometimes it can be a few hours before you can do that. Then the stain is slightly set. Salt sounds like a good backup. for the sinus cleanser you should never use tap water – only bottled or boiled and cooled water!